There is nothing more patronising than watching a brown-faced, caricatured version of yourself repeating your own experiences back to you, writes Samayya Afzal in her review of My Week As a Muslim. 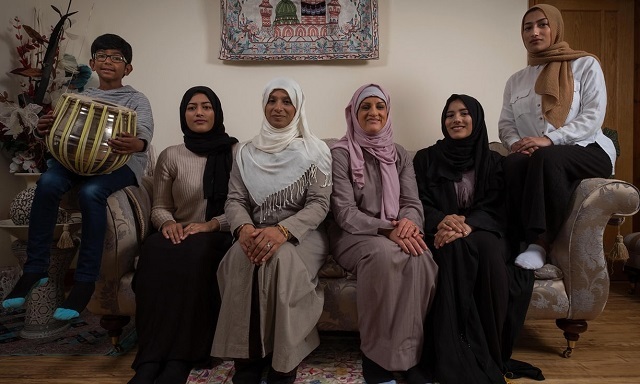 What comes to mind when you hear the term “British Muslim?” My Week As a Muslim, the latest documentary to invite the nation into Muslim homes — to observe them in their natural habitat — would have you believe it’s a Pakistani woman with a noticeably large nose and brown skin, covered head-to-toe in swathes of fabric. You’d be forgiven for almost expecting David Attenborough’s voice to ease you into the daily practices of these aliens. The first few minutes of My Week As a Muslim are dominated by self-confessed Muslim-sceptic Katie Freeman sharing her views, which range from orientalist fantasy to overt racism. She supports an outright ban on the ‘burka’, and would never sit next to one of ‘those’ Muslims on a bus — for fear of being blown up. 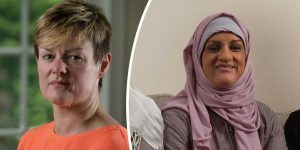 It quickly transpires that despite being in her early-forties, Katie has very little experience of Muslims or, apparently, any other group of people from a different ethnic background to herself. Of course, had she actually been Asian, Katie would be described as someone who’d led a segregated existence; and deemed a failure of integration and multiculturalism. However, she is white, and this treatment can never be reserved for the Katies of this world, even those cocooning themselves from invasion in the heart of Cheshire. While always friendly, most of the interactions between the (eternally patient) host, Saima Alvi, and Katie seem to proceed along the lines of a police interrogation; with Saima, in her role as official “Muslim myth-buster”, often delivering her ‘explanations’ with an air of apologetic defensiveness. One example is a conversation in the aftermath of the Manchester attack, where Katie presses her belief that mosques are breeding grounds for terrorists. Anyone aware of the research around radicalisation knows that this isn’t the case, but frustratingly, empirically-supported research that mosques aren’t a primary source of radicalisation is dismissed as mere ‘opinion’ without a challenge. This leaves a bitter taste upon reflection, especially considering the Manchester bomber himself was the subject of concerns raised by his local mosque. Unsurprisingly, lack of trust in what Muslims like Saima say, no matter how qualified or informed, is a familiar symptom of Islamophobia. Whilst the executive producer’s intention of counteracting Islamophobia in modern Britain is a noble one, in practice the documentary couldn’t have had a more opposite effect. The notion that to understand how overt Islamophobia operates in society, one should quite literally place themselves in the shoes of a Muslim is a simplistic one. A simpler, yet far more effective approach could have been considered: listening and speaking to actual Muslims. Incredibly, the documentary doesn’t offer a single example of accountability for the distasteful questioning of Muslims. The episode is filmed amidst the aftermath of the Manchester attack, yet not once is the sensationalised, inaccurate and discriminatory reporting of Muslim-related news challenged as a radicalising factor for white, non-Muslim Britons. We are shown nameless, faceless people shouting slurs in the streets, but where are the organisations that systemically turn away Muslim applicants because their names sound too “foreign”? Some will say that faithfully representing the nuances of a 2.8 million-strong community in a documentary covering such a broad issue is an impossible task, but there is nothing more patronising than watching a brown-faced, caricatured version of yourself repeating your own experiences back to you. Why is it that when we relate the same experiences, we are ignored, belittled and called extremist, instead of being believed and given this platform? The steady increase in negative portrayals of Muslims across the UK media, and the securitisation of Muslim identity in government policies have long been documented. Despite countless reports, hundreds of articles, and thousands of Muslims recounting personal experiences of discrimination, the UK at large is still not prepared to accept our word for it. My Week As A Muslim legitimises this blind spot, when it should have brought it into the light and challenged it. If every Muslim family in the UK adopted an Islamophobe or two, it still wouldn’t change the way Islamophobia is societally entrenched. To effect such a change, you’d have to encourage people to embrace a critical lens when consuming mainstream narratives. Current government policies, after all, depend on the kind of permissibility created by a population’s fear of the “other”. As far as the wider population is concerned, it should be common decency, not ethnic affinities, that allows you to empathise and acknowledge the humanity of others. I don’t have the luxury of dressing up as a white non-Muslim for a week, but if that’s the length you have to go to to accept that Muslims, too, are human beings, it’s hard to think of a more damning indictment of the prevalence of British racism. Samayya Afzal is an activist based in Bradford, UK, with experience in the HE sector, focusing particularly on racism, feminism and anti-Islamophobia. She co-founded the national Students Not Suspects campaign, exploring the relationship between counter-terrorism, the state and Muslim communities. She has also worked in diversity development, curating exhibitions related to the South Asian diaspora.. You can find her on Twitter at @SamayyaAfzal.